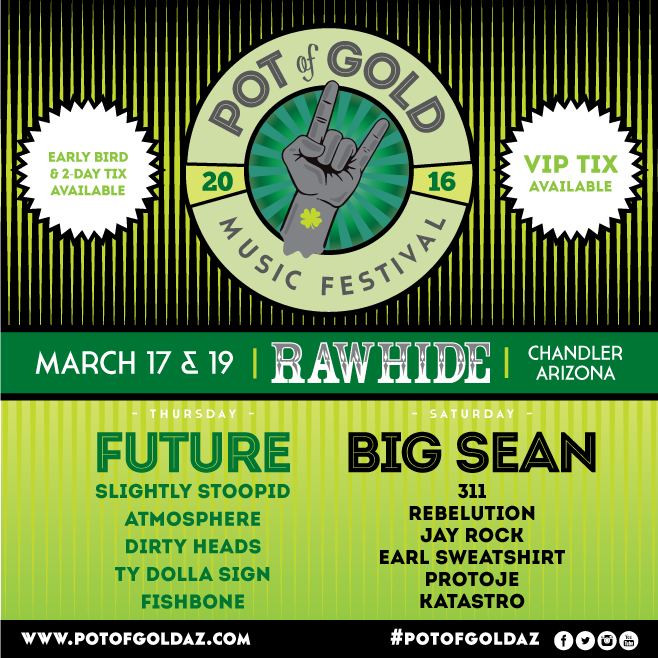 Tempe, AZ – Lucky Man Concerts is proud to present the 2nd Annual Pot Of Gold Music Festival at Rawhide in Chandler. The all-ages, rain or shine event begins Thursday, March 17 at 2:30pm (gates 1:30pm), and continues Saturday, March 19 at 1:00pm (gates 12:00pm). Single-day and two-day discount tickets are available for advance purchase atwww.potofgoldaz.com, www.luckymanonline.com, the Marquee Box or by phone at 877-318-4540. The first 1,000 single-day tickets are priced at $40, with the next 1,000 tickets being priced at $50. The remaining single-day tickets after that are priced at $65. Two-day discount tickets are also available, starting at $65 for the first 1,000 tickets, $80 for the next $1,000 tickets after that, and $110 for remaining two-day tickets. All prices above are subject to facility, service, and order fees per ticket and per order. A limited number of VIP tickets are being offered for $175 per day (plus applicable facility, service, and order fees). VIP tickets include separate VIP check-in, laminate and lanyard, VIP entrance into Rawhide lawn area, access to VIP viewing area, private air conditioned bathroom trailer, VIP parking (one parking space per four tickets purchased in a single transaction), and festival merchandise. “We are very excited about our new location at Rawhide. Rawhide’s management team has been great to work with in planning the 2016 festival. The venue provides a wide open site with unobstructed views of the stage, a VIP viewing area, expanded areas for food and non-food vendors, and use of Frontier Hall, which all together should translate into a better experience for all patrons. The Rawhide site provides accessible freeway access, an easy drop off/pick up area, and plenty of parking within walking distance of the venue. The 2016 lineup brings together a highly successful mix of performers where rap and hip hop artists will be performing side by side with rock, reggae, ska, and punk bands.” Tom LaPenna, Lucky Man Concerts. All bands and lineup are subject to change. Bios available upon request.